The national flag of Bhutan (Dzongkha: ཧྥ་རན་ས་ཀྱི་དར་ཆ་) is one of the national symbols of Bhutan. The flag is based upon the tradition of the Drukpa Lineage of Tibetan Buddhism and features Druk, the Thunder Dragon of Bhutanese mythology. The basic design of the flag by Mayum Choying Wangmo Dorji dates to 1947. A version was displayed in 1949 at the signing of the Indo-Bhutan Treaty. A second version was introduced in 1956 for the visit of Druk Gyalpo Jigme Dorji Wangchuk to eastern Bhutan; it was based upon photos of its 1949 predecessor and featured a white Druk in place of the green original. The Bhutanese subsequently redesigned their flag to match the measurements of the flag of India, which they believed fluttered better than their own. Other modifications such as changing the red background color to orange led to the current design, in use since 1969. The National Assembly of Bhutan codified a code of conduct in 1972 to formalize the flag's design and establish protocol regarding acceptable flag sizes and conditions for flying the flag. Historically Bhutan is known by numerous names, but the Bhutanese call the country Druk after the name of the Bhutanese thunder dragon. This tradition dates to 1189 when Tsangpa Gyare Yeshe Dorje, founder of the Drukpa lineage of Tibetan Buddhism, was in Phoankar (Tibet) where he reportedly witnessed the Namgyiphu valley glowing with rainbow and light. Considering this an auspicious sign, he entered the valley to choose a site for the construction of a monastery, whereupon he heard three peals of thunder – a sound produced by the druk (dragon) according to popular Bhutanese belief. The monastery that Tsangpa Gyare built that year was named Druk Sewa Jangchubling, and his school of teaching became known as Druk. The Druk school later split into three lineages. One of these three, Drukpa, was founded by Tsangpa Gyare's nephew and spiritual heir Önrey Dharma Sengye and afterward spread throughout Bhutan. The nation itself would also later become known as Druk. This legend offers one explanation for how the symbolism of the dragon came to form the basis of the national flag of Bhutan. An alternative hypothesis maintains that the notion of symbolizing sovereign and state in the form of a dragon emerged in neighboring China and was adopted by the rulers of Bhutan as a symbol of royalty in the early 20th century. The current flag is divided diagonally from the lower hoist-side corner, with the upper triangle yellow and the lower triangle orange. Centred along the dividing line is a large black and white dragon facing away from the hoist side. The dragon is holding a norbu, or jewel, in each of its claws. The background colours of the flag, yellow and orange, are identified as Pantone 116 and 165 respectively. Equivalents of these shades and the white of the Druk are specified by various other codes according to particular matching systems as indicated below. 9 in × 6 in (23 cm × 15 cm), for car flags. The Centre for Bhutan Studies, an independent Bhutanese research centre, in 2002 issued a paper (henceforth the "CBS document") that is the only readily available account from Bhutan of the historical development of the national flag. The document draws heavily on first-hand accounts obtained through interviews with individuals personally involved in the creation and modification of the flag in Bhutan, from the late 1940s until the adoption of the current flag around 1970. This report is therefore a significant primary source for information about the history of the Bhutanese flag. But in the description of the flag from 1949, the document is not in complete accord with photos of the flag (as discussed below), making it difficult to interpret some of the document's assertions. As a record, however, of the few primary sources remaining – namely, the people involved in the flag's history and the handful of existing government records – it represents a valuable source of information about the otherwise poorly documented evolution of the Bhutanese flag. This illustration of the first national flag of Bhutan, used in 1949 at the signing of the Indo-Bhutan Treaty, is based upon black-and-white photos of the event with colours supplied from later documentation. The CBS document states that the first national flag was designed upon the request of Jigme Wangchuck, the second Druk Gyalpo of the 20th-century Kingdom of Bhutan, and was introduced in 1949 during the signing of the Indo-Bhutan Treaty. 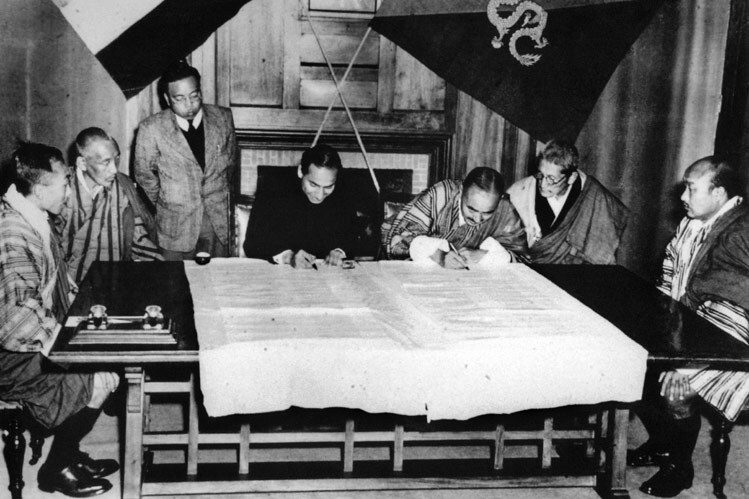 While the document does not provide an illustration of the original design, black-and-white photographs taken at this historic event provide images of the first Bhutanese flag at the ceremony. The design of the flag is credited to Mayeum Choying Wongmo Dorji in 1947. Lharip Taw Taw, one of the few painters available to the royal court at the time, is said to have embroidered the flag. Druk was colored green in accordance with traditional and religious references to yu druk ngonm (Dzongkha: གཡུ་ རབྲུག་ སྡོནམ), or "turquoise druk." Today, a modern reproduction of this historic original (with several significant changes influenced by the modern flag) is displayed behind the throne in the National Assembly Hall in Thimphu. According to the CBS document, the original Bhutanese flag was a bicolour square flag divided diagonally from the lower hoist to the upper fly. The field of yellow extended from the hoist to the upper fly, and the red field extended from the fly end to the lower hoist. In the centre of the flag, at the convergence of the yellow and red fields, is a green Druk, located parallel to the bottom edge and facing the fly. However, the CBS document does not illustrate the early versions of the flag and its description of the 1949 flag is not entirely consistent with the photos surviving from 1949. It describes the flag as "square", while the proportions of the flag in the photographs appear closer to 4:5. The document describes the dragon as "facing the fly end", while the dragon visible in the photos faces the hoist. The dragon is described as "parallel to the fly" (meaning, according to a diagram in the document, parallel to the length along the bottom edge of the flag), while the dragon in the photos appears to have a slightly rising vertical slant. The dragon is described as "green", but the shade in the photos, if indeed green, must be very pale. Western flag books until after 1970 generally show the Bhutanese flag closely resembling the 1949 photos. The second version of the national flag was developed in 1956 for the visit of the third Druk Gyalpo Jigme Dorji Wangchuk to eastern Bhutan. During the trip the Druk Gyalpo's Secretariat began to use flags of a new design based upon a photograph of the first national flag of 1949, with the colour of the dragon changed from green to white. The retinue of the Druk Gyalpo included a convoy consisting of over one hundred ponies; a small version of the flag was placed on the saddle of every tenth pony, and a large flag approximately 6 square feet (0.56 m2) in size was flown in the camp every evening, hoisted to the sound of a bugle. Beginning in the late 1950s, Dasho Shingkhar Lam, former Secretary to Jigme Dorji Wangchuck and Sixth Speaker of the National Assembly (1971–74), was requested by the king to make several modifications to the flag; he is responsible for its current design, which has remained unchanged since 1969. The king was reportedly dissatisfied that the early square Bhutanese flags did not flutter like the rectangular Indian flag displayed on the visit of an Indian official to the country. The standard measurements of the flag of Bhutan were thereafter altered to resemble the flag of India, which was 9 feet by 6 feet. In another change, the dragon, which had formerly been placed in a roughly horizontal position in the center of the flag, was repositioned to spread out over the diagonal dividing line between the background colours. This change sought to avoid having the dragon "face the earth" when the flag was hanging limp. Bhutanese artist Kilkhor Lopen Jada painted a new design for the druk in which the curves of the dragon's body are relaxed to create a somewhat longer and more gently undulating shape. The CBS document states that the king ordered the colour of the lower half changed from red to orange "sometime in 1968 or 69." The Bhutanese flag was flown abroad beside another nation's flag for the first time in 1961 during a state visit to India by Jigme Dorji Wangchuck. This visit inaugurated a new level of relations between the two countries. The flag of Bhutan figures on the livery of the national airline Druk Air. On 8 June 1972 the National Assembly of Bhutan approved Resolution 28, bringing into effect National Flag Rules drafted by the Cabinet. The rules have eight provisions covering the description and symbolism of the flag's colouring, fields and design elements. Other rules relate to the size of the flag as well as flag protocol including the appropriate places and occasions for flying the flag and who may display the flag on cars. In general, the flag is given as much respect as the Bhutanese state and the head of state. As in the United States Flag Code, no other flags must be placed higher than the Bhutanese flag, the flag cannot be used as a cover or drape (with some exceptions) and the flag must not touch the ground. Other provisions include prohibitions on including the design in other objects or in a logo. Exceptionally, the flag may be used to drape coffins, but only those of high-ranking state officials such as ministers or military personnel. The 1972 rules also provide that "every dzongkhag [district headquarters] will hoist the national flag. Where there are no dzongkhag, the national flag will be hoisted in front of the office of the main government officer". Officials above the rank of minister are allowed to fly the flag at their residence provided they do not live near the capital. The tradition of flying the national flag in front of government offices had not existed in Bhutan prior to 1968 but was decreed standard practice by the Druk Gyalpo after his Secretariat was moved from the city of Taba to Tashichho Dzong in that year. The only flag day prescribed in the 1972 rules is National Day, which is held annually on December 17. National Day commemorates the crowning of Ugyen Wangchuck as the first king of Bhutan on December 17, 1907. ^ a b c "National Flag". National Portal of Bhutan. 2004. Archived from the original on 2010-10-12. Retrieved 2010-09-25. ^ a b Crins, Rieki (2009). Meeting the "Other": Living in the Present: Gender and Sustainability in Bhutan. Eburon Publishers. pp. 112–113. ISBN 978-90-5972-261-3. Retrieved 2010-10-10. ^ Von Gersdorff, Ralph (1997). Bhutan: Mountain Fortress of the Gods. Serindia Publications. p. 184. ISBN 978-0-906026-44-1. Retrieved 2010-10-10. ^ a b Dubgyur, Lungten. "The Royal Court of Justice Crest". Royal Court of Justice, Bhutan. Archived from the original on 2011-03-20. Retrieved 2010-10-10. ^ Bates, Roy (2007). All About Chinese Dragons. p. 102. ISBN 978-1-4357-0322-3. Retrieved 2010-10-10. ^ "Flag of Bhutan". Encyclopedia Americana: Falstaff to Francke. 11. Scholastic Library Publishing. 2006. p. 356. ^ a b Specification Sheet 007. William Crampton Flag Institute. 1 August 1994. ^ a b c d e f "The National Flag Rules of Bhutan (1972)" (PDF). 1972. Archived from the original (PDF) on 2012-04-24. Retrieved 2010-09-25. ^ a b c "First Schedule – The National Flag and the National Emblem of Bhutan". The Constitution of the Kingdom of Bhutan (PDF). constitution.bt. July 18, 2008. Archived from the original (PDF) on July 6, 2011. Retrieved October 8, 2010. ^ a b c "National Symbols". Department of Information Technology. 2008. Archived from the original on 2011-07-06. Retrieved 2010-09-25. ^ "First Schedule – The National Flag and the National Emblem of Bhutan". Constitution of the Kingdom of Bhutan. 2008. Archived from the original on 2011-07-06. Retrieved 2010-09-25. ^ "About the Center". Archived from the original on 16 October 2011. Retrieved 3 April 2012. ^ One photo (see "Indo-Bhutan Friendship Treaty, 8th of August, 1949". New Delhi: National Gallery of Modern Art. Retrieved 2010-12-22. ) was displayed in 2009 in the exhibition "Bhutan: An Eye to History". New Delhi: National Gallery of Modern Art. Retrieved 2010-12-22. BBC coverage of this exhibition (see "In pictures: Rare images of Bhutan go on display". BBC. 2010-02-14. Retrieved 2010-12-22. ) supplies the following caption for this photo: "The India-Bhutan Friendship Treaty of 1949 is the basis of close ties between Bhutan and India. It was signed at government house in Darjeeling in 1949. (Image: Queen Grandmother of Bhutan)." ^ "Indo-Bhutanese Treaty". Bhutan 2008. Archived from the original on 2010-10-04. Retrieved 2010-12-22. ^ a b Gyeltshen, Tshering (2002). "First national flag designed in 1949". Kuensel Online. Kuensel Corporation. Retrieved 2010-10-10. ^ I.O. Evans (1963). The Observer's Book of Flags. ^ Gordon Campbell and I.O. Evans (1965). The Book of Flags. ^ E. M. C. Barraclough (1965). Flags of the World. ^ Karl-Heinz Hesmer (1975). Flaggen Wappen Daten. ^ Ura, Karma (1995). The Hero With a Thousand Eyes. Karma Ura. p. 232. ISBN 9788175250017. ^ Costantino, Maria (2001). The Illustrated Flag Handbook. Gramercy Books. p. 46. ISBN 9780517218105. ^ Warikoo, K. (2008). Himalayan Frontiers of India: Historical, Geo-Political and Strategic Perspectives. Routledge. p. 142. ISBN 978-0-415-46839-8. Retrieved 2010-09-28. ^ National Assembly Secretariat (1999). Proceedings and Resolutions of the National Assembly from 31st to 50th sessions, Vol. 2. Government of Bhutan. p. 97. Wikimedia Commons has media related to Flags of Bhutan. This page was last edited on 14 October 2018, at 15:57 (UTC).